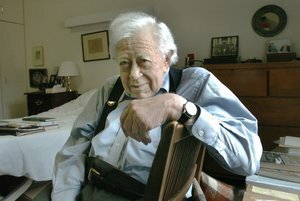 Calvin Kytle, author of the Depression-era novel Like a Tree, died June 5, 2008; he was 88. Kytle was also the author of the young-adult biography Gandhi, Soldier of Nonviolence and Who Runs Georgia? with Congressman James Mackay. He founded Seven Locks Press in 1978, publishing authors including Bill Moyers. He worked as a reporter for The Atlanta Journal Constitution and the Calhoun, Ga., Times, as well as an executive for Nationwide Insurance company. Kyle served as deputy director of the US Community Relations Service, created by the 1964 Civil Rights Act, from 1964-1965. Kytle released his first novel, Like a Tree, at age 87. Like a Tree tells the story of the Krueger family, and how they survived the spirit-breaking years of the 1930s Depression. Foremost among the Krugers is Douglas, who struggles with mental illness throughout his life. Kytle paralleled Douglas’s achievements and setbacks with that of the country’s, fully demonstrating how the fate of the United States and the lives of its people are intertwined. Calvin Kytle was married for more than sixty years to the former Elizabeth Larisey, also an author. They retired to Carolina Meadows retirement community in Chapel Hill, North Carolina, in 1991. Like a Tree is available from NewSouth Books, Amazon.com, or your favorite local or online book retailer. You are currently browsing the archives for the Like a Tree category.